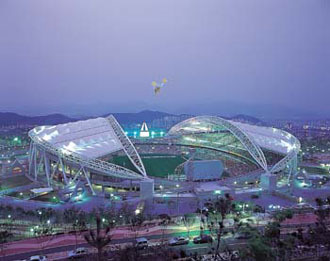 The City of Daegu is located in the South East of the Korean Peninsula. Daegu is surrounded by several famous mountains. In the North Mt. Palgongsan, to the South Mt. Daedeoksan and Biseulsan, there are some low mountains located to the west and east. The Sincheon River runs through the central area of the City. In the northern area of Daegu, the Geumhogang River flows from east to west and joins the Nakdonggang River. The Nakdonggang river is the longest river in South Korea. Because Daegu is surrounded by high mountains in the North and South it often gets very cold in the winter and hot and sticky in the summer. Daegu is famous because of these hot summers. The heavy rain season is between the summer months of June and September. The hottest period is July through August, January is the coldest month. Yugasa Temple, located in the valley of Mt. Biseulsan, was founded by a Buddhist teacher Doseongguksa in 827 AD. There are a lot of folk tales related to Doseongguksa in Mt. Biseulsan. Various rock cliffs surround the temple like a screen. This stone pagoda stands in front of Geungnakjeon Hall, located in Yongyeonsa Temple. This pagoda is presumed to be one of the Goryeo Dynasty style. A total of 211 ancient tombs give visitors an impression of the burial culture during the three Kingdoms are. The tombs are believed to be the tombs of those who ruled the area. These tombs are well preserved. One of our guests visited a similar place like this, it is nice but after 10 minutes you have seen it.